Daniel Narducci – Courtesy of Indianapolis Opera. Used with permission. American baritone Daniel Narducci will have a unique perspective when he plays the role of King Arthur in Indianapolis Opera‘s production of Lerner & Loewe‘s classic musical “Camelot,” presented at Schrott Center for the Arts at Butler University March 22-24. Narducci, 51, played the role of Lancelot on tour opposite Robert Goulet, who played King Arthur. At the time, Narducci was 28 and later, at the age of 31, he reprised the role of the younger knight in a second tour. 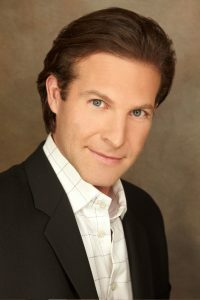 Narducci has performed with some of the world’s most prestigious opera companies and on numerous operetta and musical theatre stages throughout North America and Europe. A multi-faceted artist, Narducci has performed in live stage presentations, recordings, documentaries, and television. Since his professional debut with the Cincinnati Pops Orchestra, under the direction of Erich Kunzel, Narducci has sung with many of the world’s most renowned orchestras as well. Nationally acclaimed director Scott Perry will direct Narducci and his castmates in IO’s “Camelot,” which premiered on Broadway in 1960 and led to the 1967 film version. The original Broadway cast album topped the charts for 60 weeks, with a score that included “If Ever I Would Leave You, “I Loved You Once in Silence, “The Lusty Month of May,” and the show’s title song “Camelot.” The original production was followed by numerous revivals of the musical that recounts the story of King Arthur, who hopes to create a kingdom of honor and dignity, embodied by his Knights of the Round Table. But when his queen Guinevere falls in love with young Knight Lancelot, the King’s ideals are tested and the future of the kingdom hangs in the balance. Written like an operetta for the musical theatre stage, IO refines this classic tale for a contemporary audience. “And how is it switching roles from Lancelot to King Arthur?” I asked. “I think that I bring a perspective that is going to be helpful as I play Arthur. I have a son who just turned 18 and 20 years of life experience that I can bring to the table that will be helpful,” said Narducci. Narducci, who is a voice teacher at the University of Indianapolis, is looking forward to singing the role of Arthur because his voice is in its prime. “The wisdom is we really come into our own and reach full maturity in our 40s and ideally, it lasts into our 60s. If we are blessed and take care of ourselves and the instruments, we can sing into our 70s. I have an awareness, knowledge and understanding of how my voice works. It wasn’t until I was in my 30s that I started to figure out the technical aspects of the voice because we can rely on our youth for only so long. That is where the teaching has really helped in that, not only do I teach my students what to do, but I apply the techniques as well and it helps me with my own problem solving if I am struggling,” said Narducci. “Camelot” performances are Friday, March 22 at 7:30 p.m., Saturday, March 23 at 7:30 pm. and Sunday, March 24 at 2:30 pm. All performances will take place at the Schrott Center for the Arts at Butler University. Tickets range from $35 – $86. For tickets and more information, call (317) 940-6444 or visit indyopera.org.